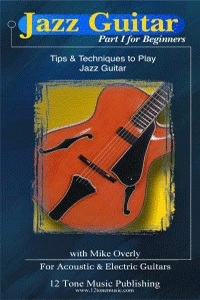 "Jazz Guitar DVD for Beginners is the perfect first step for those new to jazz guitar". - Guitar One Magazine. 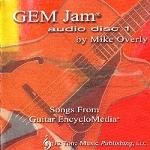 Now, for the first time on DVD, 12 Tone Music Publishing, LLC is proud to present: Jazz Guitar Part I for Beginners: Major Scale Harmony - with Mike Overly. Loaded with content, Jazz Guitar Part I for Beginners: Major Scale Harmony includes a bonus instruction sheet that will carefully take you step-by-step through the featured major scale and modes, chords, and arpeggios so that you may easily follow the video and play along. Jazz Guitar Part I gives you a unique experience to learn from Mike Overly - one of today's most influential guitar educators and the author of the best selling Guitar EncycloMedia, Guitar Fretboard Facts and creator of the original Fretboard Flashcards for Guitar. Mike's powerful point of view, combined with his unique teaching tools, continues to revolutionize the world on how to think and play guitar. With Jazz Guitar Part I for Beginners: Major Scale Harmony, you will clearly understand and start playing jazz guitar from the beginning.